The 5.2 channel AVR-S540BT features Dolby Vision, HDR, HLG and 4K Ultra HD video pass-thru with 5 HDMI inputs / 1 output. Stream your favorite music tracks wirelessly via Bluetooth. With our award-winning Denon Setup Assistant, the Denon AVR-S540BT is just as easy to setup as it is to enjoy. The 5.2 channel AVR-S540BT features Dolby Vision, HDR, HLG and 4K video pass-thru for a stunning home theater experience. It includes 5 HDMI inputs at 4K/60 Hz with full-rate pass-through and HDCP 2.2 support on all HDMI ports. Use the front panel USB port to listen to your favorite tracks seamlessly, or stream music via Bluetooth with your smart devices. Control power, volume and source with the Denon 500 Series Remote app. With our award-winning Denon Setup Assistant, the AVR-S540BT is just as easy to setup as it is to enjoy. Featuring discrete power output devices on all channels, the AVR-S540BT delivers a maximum of 140 watts per channel. It’s equipped with low impedance drive capability for operational stability within a wide range of speakers. The advanced HDMI video section of the AVR-S540BT lets you enjoy your favorite movies and shows with the best picture quality available. All five HDMI inputs support 4:4:4 Pure Color sub-sampling, HDR, BT.2020 pass-through, Dolby Vision compatibility and HLG (Hybrid Log-Gamma); full 4K Ultra HD with 60Hz pass-through and HDCP 2.2 processing is available on three HDMI ports to support copy-protected content. The AVR-S540BT supports High Dynamic Range (HDR) video format. It is even ready for Dolby Vision and HLG (Hybrid Log Gamma). Dolby Vision transforms the viewing experiences with astonishing brightness, contrast, and color. HLG offers HDR technology over broadcast content. The included AVR-S540BT Quick Start Guide provides simple, clear instructions for how to get started. Once you connect your TV to the AVR-S540BT via HDMI, the exclusive Denon Setup Assistant appears on your TV screen to walk you through setup, step by step. A row of color-coded speaker connections is laid out horizontally, making organizing and connecting speaker wires simple. Your favorite tracks, at your fingertips. Stream music from your computer or smart devices with the AVR-S540BT and built-in Bluetooth. It can remember up to eight paired Bluetooth devices, so invite family and friends to share their music and enjoy the audio quality of the AVR-S540BT. To stream via Bluetooth, simply select the Denon AVR-S540BT from the Bluetooth menu on your smart device. Better control in your back pocket. The Denon 500 Series Remote app for iOS and Android makes using the AVR-S540BT even easier — adjust volume, turn it on or off, mute the music, and select a source. Download the Denon 500 Series Remote app today. The Denon AVR-S540BT front panel features four Quick Select buttons that store your preferred audio settings for each source. Switch between TV audio, Blu-Ray, media players and more–and the AVR-S540BT adjusts the EQ settings to your preferences for that media source. Use the buttons on the front panel or opt for the same Quick Selects on the AVR remote for faster control. 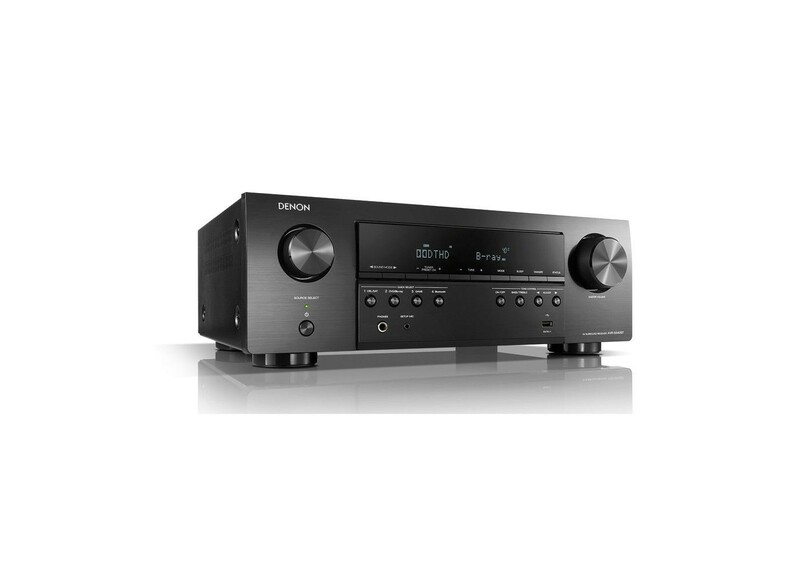 Connect the AVR-S540BT to the Denon HEOS Link (sold separately) for wireless music streaming and the ultimate in sound quality. The HEOS Link enables the AVR-S540BT to play back nearly unlimited online streaming services like Spotify, TIDAL, Pandora and more. With the HEOS Link you can add HEOS multi-room audio to your home theater audio system, and you can play different songs in different rooms or the same song in every room. Also available is is ability to control your HEOS experience with Amazon Alexa voice commands. Once connected, use the HEOS app to control the AVR remotely. Enjoy more music and flexibility with the same great Denon quality.